The Neustadt Collection of Tiffany Glass is located on 46th Avenue between 5th Street and Vernon Boulevard in Hunters Point. LONG ISLAND CITY — A studio in Queens not normally open to the public will offer behind-the-scenes tours next month of its massive collection of Tiffany lamps, windows and other works, including more than 250,000 pieces of the richly colored sheet glass. The Neustadt Collection of Tiffany Glass, located on 46th Avenue between Fifth Street and Vernon Boulevard, will be hosting the tours on Oct. 14 and 15 as part of Open House New York, an annual event that lets people explore buildings and sites across the city that aren't normally accessible. The collection is the work of Dr. Egon Neustadt, an orthodontist and real estate developer who spent decades amassing a number of Tiffany lamps and artifacts before his death in 1984. Today, the Neustadt Collection is a nonprofit dedicated to preserving and promoting Tiffany glass, which was manufactured for years in nearby Corona. Tours of the collection during Open House New York will be led by the Neustadt's curator and conservator, and will be able to accommodate up to 16 people at a time. Those interested can reserve a spot in advance by registering online starting Oct. 4. The event is free, but there is a $5 fee to register. The Neustadt Collection has not historically been open to the public, though a portion of it is always on view at the Queens Museum, which has a permanent gallery dedicated to displaying some of the works. 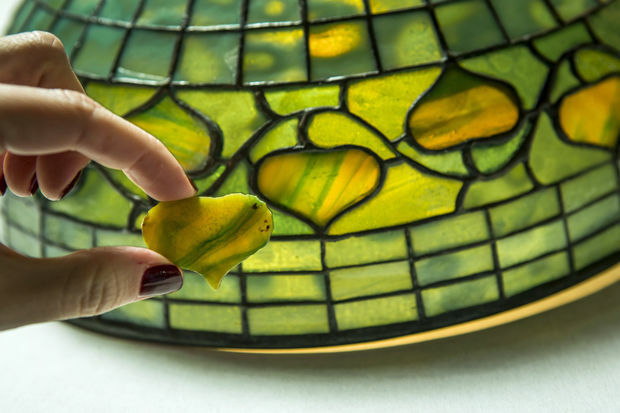 Besides the two days of tours during Open House New York, the studio is also starting to offer appointment-only viewings of its Tiffany glass archive for groups of up to 10 people, at the cost of $25 per person, according to a spokesman. Those interested in making an appointment should contact 718-361-8489.